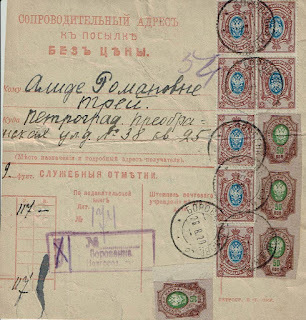 It is well known that after their seizure of power in 1917, the Bolsheviks continued to print Imperial Arms stamps in many of the previous denominations. This is most obviously the case for the rouble value stamps which were reprinted in a different sheet format with horizontal instead of vertical varnish lines. Most - but perhaps not all - of the stamps printed were perforated thus allowing imperforate stamps printed earlier in 1917 to be withdrawn from use if they had not already been used up. I was assembling a collection of some 67 parcel cards and money transfer forms from the period April - December 1920, immediately after the revaluation x 100 of low value kopeck stamps up to and including the 20 kopeck stamp. 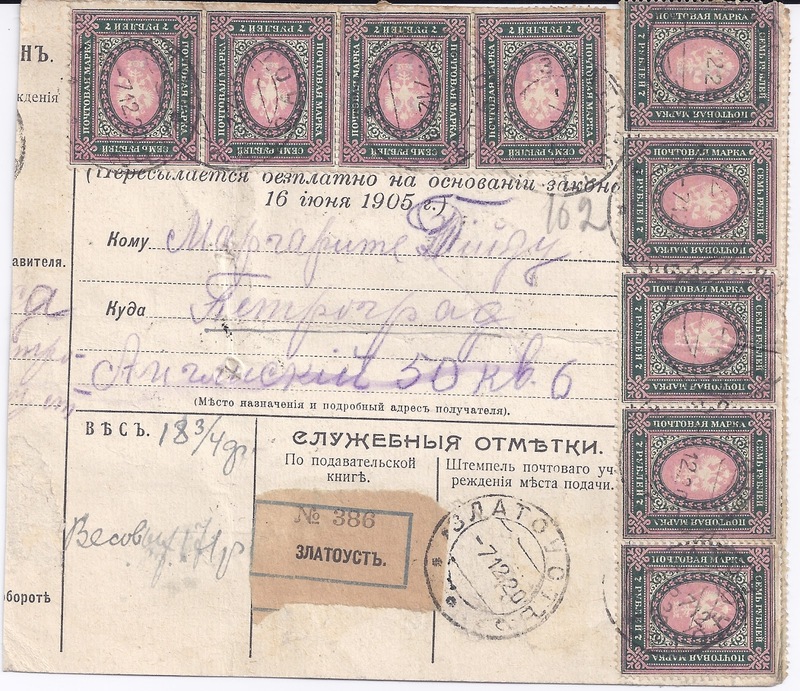 The 25, 35, 50 and 70 kopeck stamps continued to be used at face as did all the rouble values. I counted up the stamps of different denominations on my 67 forms, all of them franked with Imperial Arms definitives except for one solitary Postal Savings Bank stamp. Some interesting patterns emerged. 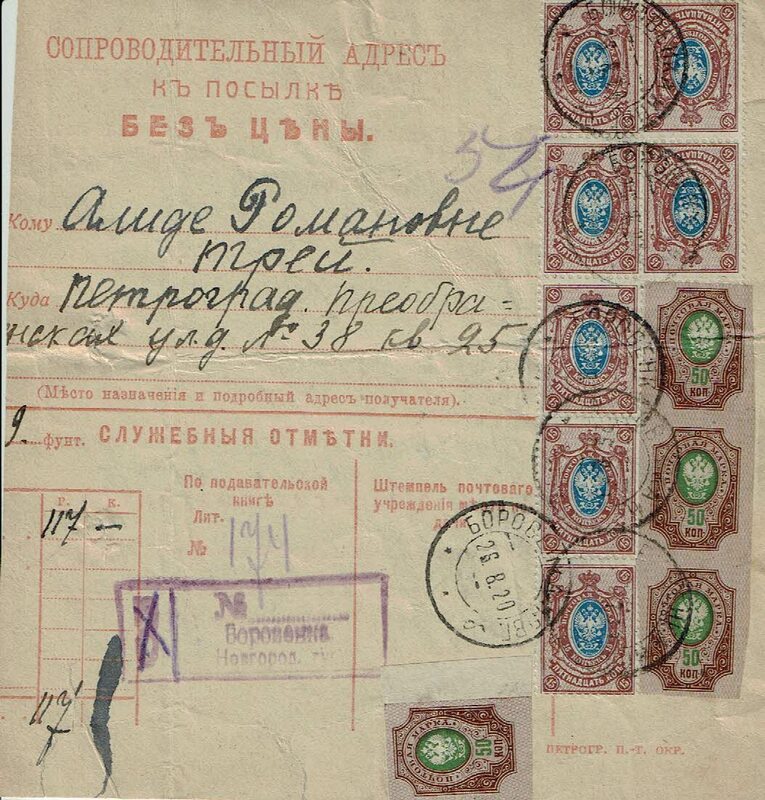 There were no perforated 1 kopeck stamps on any of the forms but there were 39 imperforate ones, which in context suggests that the Bolsheviks (understandably) were not reprinting the 1 kopeck stamp so that all that remained at post offices were left-overs of the 1917 imperforate printing. 10 rouble: 28 perf, 0 imperf. 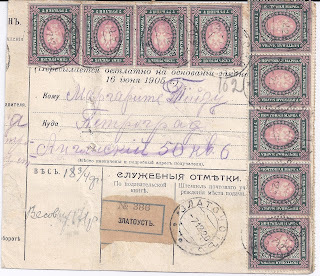 Now the 10 rouble imperforate was never a common stamp and such used copies as there are date from end 1917 through end 1918. 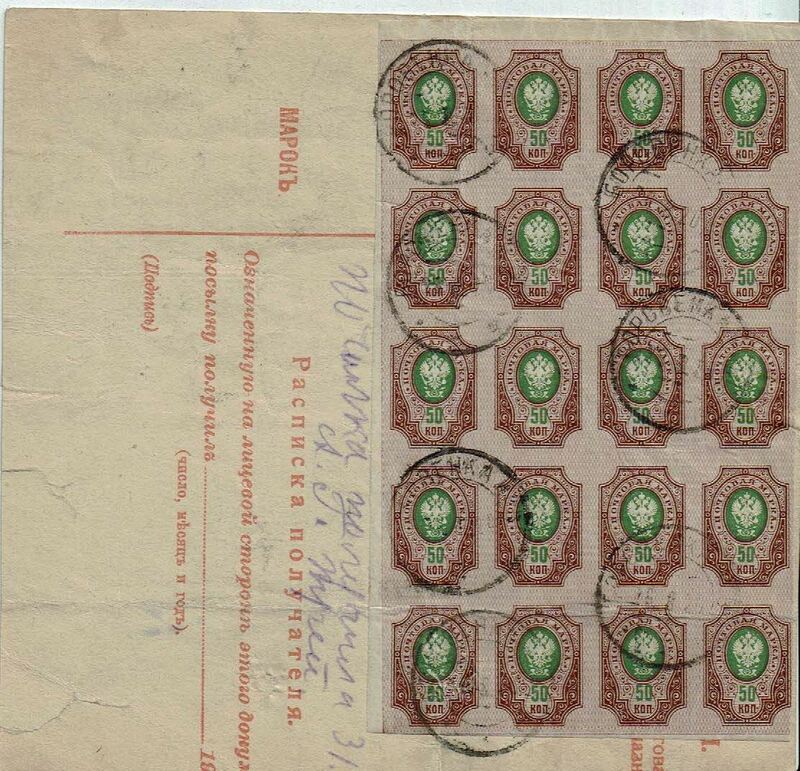 The 7 rouble imperforate is much more common but it seems that by 1920 it had been used up. Copies with 1918 and 1919 cancellations are quite easy to find. The perforated stamps on my cards are nearly all from obvious fresh printings. There are no 35 kopeck or 70 kopeck stamps at all, perforate or imperforate, on any of the cards and only 24 perforated 25 kopeck stamps and 25 perforated 50 kopeck stamps. I think these stamps, in the same format as the revalued stamps were probably being held back to avoid confusion about their face value. Twenty two of the 24 copies of the 25 kopeck stamp are on just one card (and the remaining two used as a pair to make 50 kopecks). 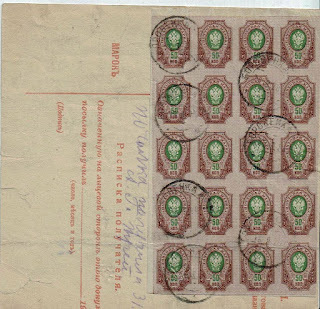 The 50 kopeck stamps are more widely distributed across the cards and charges for parcels quite often show a 50 kopeck component which this stamp then matches. The 4 kopeck stamp is interesting. There are 31 perforated and 58 imperforate, the latter mostly in multiples on a few cards. This stamp is hard to find used in 1917 - 1919 when it was being sold at a face value which was unhelpfully low but revalued in 1920 to 4 roubles it finds a use, if only that of being used up in multiples. Most cards are multiply franked with nearly 1300 stamps on 67 cards - roughly 20 stamps per card, which is wasteful of stamps and wasteful of time at the post office counter. The 10 rouble top value was clearly now too low and the revaluation of the 15 and 20 kopeck stamps to 15 and 20 roubles was still inadequate for post office needs.